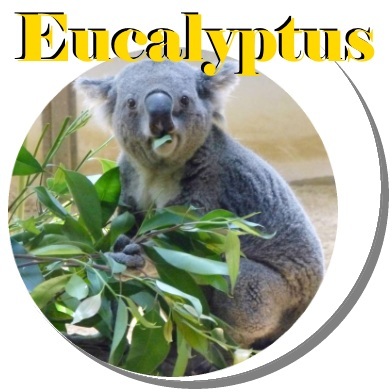 o Eucalyptus globulus – is the species that has received the most attention from botanists and chemists, and its oil is best known and most used of all eucalyptus oils. - It's cineole is between 60 and 70 percent. - is also popularly used as a fragrance in perfumes and cosmetics, and is found in mouthwashes, liniments and ointments, toothpastes, cough drops, and lozenges. - One of the most effective ways to utilize eucalyptus for colds is to drop several drops of the essential oil into your diffuser before going to sleep so you can take advantage of the healing benefits all night long. - Great to ward off dandruff and an itchy scalp. - An excellent cleanser to remove grease and grime from your workday and can rejuvenate sore hands and feet when mixed into your salt bath. - Effective at treating sinusitis. - It has vital anti-microbial properties as well. - You can drip several drops into: soap, laundry detergent, mop water, toilet cleaner, window cleaner … etc. - Wash items to remove odors with a wet rag soaked in eucalyptus oil-infused water, and place outside to dry in the sun. - You may also mix it with lemon oil or tea tree oil for an anti-stink spray. - Drip a few drops into your vacuum and clothes dryer filters to freshen them up and sanitize them a little. - Great for killing mold in your home, and you can mix eucalyptus with other oils like clove and tea tree oil to cleanse the air and maintain a mold-free home. - Highly effective at removing spots on your carpet, clothes and basically every fabric you have in the house. - Highly effective for treating respiratory problems, such as asthma, bronchitis, pneumonia. - Use eucalyptus for asthma. - Mix eucalyptus oil, peppermint oil and coconut oil for a Homemade Vapor Rub, and put on upper chest. - Antimicrobial and Antiseptic properties that are effective at treating wounds, burns, cuts, abrasions, sores and scrapes. - healing ointment and put on bug bites and stings. o 4 drops Eastern hemlock oil, 2 drops eucalyptus oil, 2 drops peppermint oil and 4 drops chamomile oil. o Add to steaming water and inhale several times daily, or add to 1/2 oz unscented balm and rub on chest as desired. o 12 drops pinon pine oil, 12 drops eucalyptus oil, 12 drops tea tree oil and 12 drops cajeput in 8oz mist bottle. o 8 drops lemon bush oil, 8 drops African bluegrass oil, 8 drops eucalyptus oil, 8 drops catnip oil and 4 drops peppermint oil. Mix with 4 oz. distilled water in spray bottle. Shake and spray as needed to repel bugs and to soothe bites. o 2 drops cedar oil, 4 drops frankincense oil, 4 drops juniper berry oil and 2 drops eucalyptus oil. Diffuse, or use in inhalation therapy, or mix several drops in 1 oz of carrier oil and apply topically to chest.